I've not measured the pressure drop but it will be minimal. The sintered silencer I'm using seems to present very little resistance blowing through it, and the silica gel crystals are large enough to have big gaps for air flow. So I thought I'd take a peek at at after it had been cooking for one hour. Superficially it all looked to have turned back to the original orange, but when I raked the surface there were still a few blue crystals, So I gave it a goodly stir up and have left it for it's second hour. I seem to remember that silica gel can absorb it's own weight in water - now there's roughly 1kg cooking, so up to a litre of water if it was all used up. Oh it's most certainly working, there is a noticeable difference in my shop air. Try a few grains "test" to see whether the colour changes! I think the gel will work still very effectively, but the indicator colour change, although it happens, isn't quite as definitive. That makes me think of other comparative tests, new and old! I think you've probably started thinking about that having begun tests! i would have though that it was the indicator capacity that would change, not the water absorption. It'll be interesting to see what you come up with! Suggest you weigh out say 50 grams, leave in damp place for some time, weigh it again. During drying weigh it say every 30 mins and watch what happens to the weights. Just a minor warning... I had a similar water filter split. I have no idea why, and I had bought it second hand so it may well have been damaged a earlier. Fortunately, it split a day after we returned from holidays and wife heard the bang and the water running. If yours was to fail, the result might be more spectacular. It might be worth considering a protective shield of some sort? Oh dear! Russ, you just reminded me of the time when our filter popped an 'O' ring. Unfortunately we were actually on holidays not just arrived home like you. Couldn't get the back door open so went to the front. Stepped inside and found myself in 1/2" of water. Thankfully the insurance covered new floor coverings. I then moved the filter outside. Ain't hind sight a wonderful thing. Still, here we are discussing compressed air so no risk of flooding, just a (shielded) bang? I cannot recall whether the specs for the water filter were discussed. Mine's rated at 160 psi but only supplied with air regulated to 100 psi so should have a bit of safety margin. However it is a sensible warning, having had a 25 mm 'stop end' blow off I'm aware of the power stored in compressed air. In the case of my main desiccant drier, it is housed in an unmanned Portakabin, so there should be no risk to life and limb. In the case of the one on my CNC Plasma Table, it is more exposed, but the input air is regulated down to 70 psi, so a higher safety margin. I made one years ago from a receiver for a large air cond. system. had screens in there and probably safe for excess of 300 psi. has a top that is removable with several screws. NOT CLEAR and it is out side on my car lift. I have never changed or reheated the silcone bead. sits for long period in the hot sun and seem to be ready all the time. I made one years ago from a receiver for a large air cond. system. had screens in there and probably safe for excess of 300 psi. has a top that is removable with several screws. NOT CLEAR and it is out side on my car lift. I have never changed or reheated the silica bead. sits for long period in the hot sun and seem to be ready all the time. I've used those exact filter cases for desiccant and coolant at 100PSI for years..
Today it was time once more to 'cook' my silica gel to remove the moisture that it had trapped. Last time the crystals, which turn blue/black when damp, lost their nice orange hue on cooking, probably because the indicator had broken down at the 140/150 deg C that I used. Great to read that your regenerative desiccant air dryer is working as designed Andrew. A very god project and I'm sure you saved quite a lot for a bigger desiccant drier compared with the commercial one I bought. 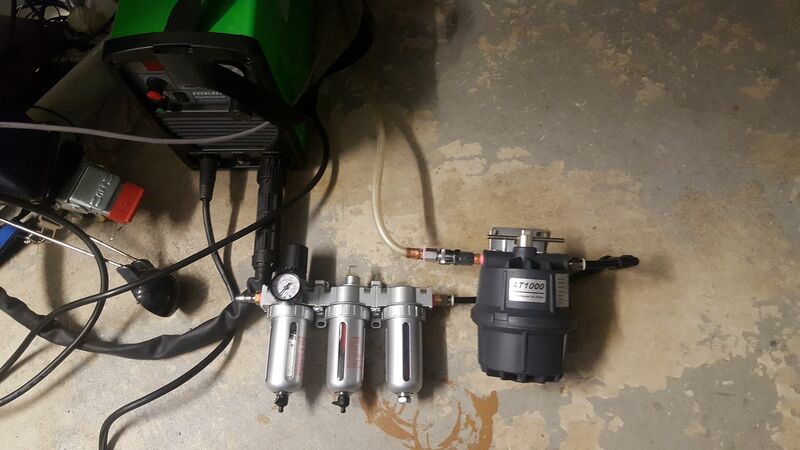 THis has a filter/regulator, coalescent filter and finally a dessicant drier which cost me about AUD $220. THe final filter is a motorguard style "toilet roll" filter which seems obligitory on all plasma cutters I've seen in operation. Well impressed, can't think how I missed this project.